Background: Cytochrome P450 2S1 (CYP2S1) is one of the ‘orphan’ CYPs, which is expressed primarily among extra-hepatic tissues and it is inducible by dioxin. Although the contribution of extra-hepatic CYPs in drug metabolism is considered less significant, they play more important roles in leading to in situ toxicity in organs with higher expression. Method: A non-systemic search was performed to review articles relevant to CYP2S1 in literature. This review will update the findings related to the expression and regulation of CYP2S1 gene and protein, substrate profiles and metabolism mechanisms, genetic polymorphisms, and their association with diseases. Results: The expression of CYP2S1 was mainly in the epithelium of portal of entry organs such as respiratory and gastrointestinal tract. Aryl Hydrocarbon Receptor (AHR) is believed to be partly involved in the induction of CYP2S1. CYP2S1 was found to activate and deactivate pro-drugs which resulted in toxicity and detoxification of carcinogens. 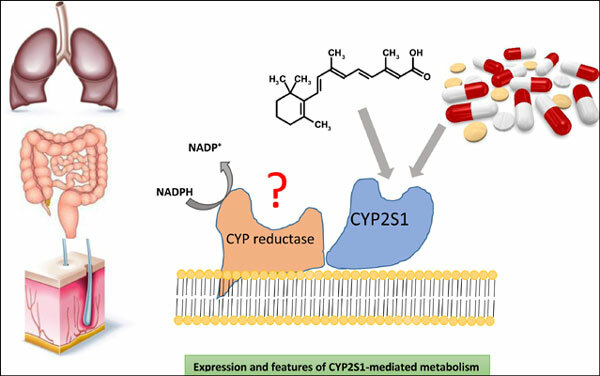 The current knowledge of the endogenous functions of CYP2S1 is largely related to cell proliferation and lipid metabolisms. Several polymorphic alleles of CYP2S1 have been reported and documented to date. Conclusion: Molecular-based investigations should be performed to better understand the regulation mechanism of CYP2S1 in various cells and tissues. It is pivotal to establish optimum expression and incubation systems in vitro to elucidate the substrate specificity of CYP2S1 and characterise the genetic consequences of variant CYP2S1 in vitro. CYP2S1, extra-hepatic expression, regulation of expression, xenobiotic metabolism, endogenous metabolism, polymorphisms.